The Burkheimer 8134-4 has become one of my favorite sticks for both summer and winter sink-tip work. Lined with a 600 grain Airflo Skagit Compact this is one of the easiest casting eight weights I’ve found. The action of the 8134 could be described as smooth silkiness with reserve power. Kind of on the fast side of medium, but a little slower than it’s big brother, the Burkheimer 8139. While I love the 8139 for booming big casts, the 8134 loads up a little quicker, making it an easier rod to cast in tight conditions. 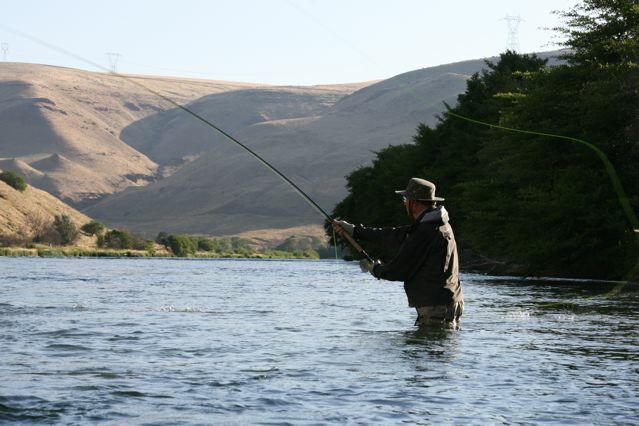 It just might be the best “Skagit Style” rod on the market. I typically cut my sink-tips to twelve feet on this rod. It will handle longer tips but I’ve got a shorter casting stroke. If you like a longer casting stroke, cut your sink-tip to the length of the rod and see how it feels. You can always cut your sink-tips back. For a running line, you can beat the Airflo 30lb. RidgeLine.